Daleks, you say? Yes, we have Daleks. 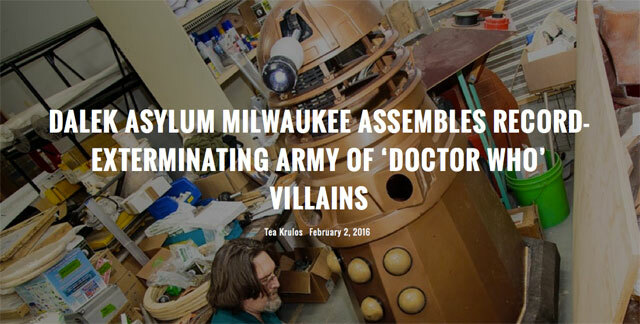 The folks at Milwaukee Record have revealed our plans to have the “Most Amount of Daleks Assembled in One Place at One Time”, or something like that. John and his gang at Dalek Asylum Milwaukee have been hard at work learning new skills to build out their Dalek army, and it’s been impressive to watch! I’m hoping to see all these Daleks at Maker Faire Milwaukee, which is happening September 24th & 25th, 2016 at State Faire Park. This entry was posted in Uncategorized and tagged daleks, doctorwho. Bookmark the permalink.